This is a copy of a letter published in The Daily Gamecock, February 3, 2014. Also available online from the paper. Please cite as: Deflem, Mathieu. 2014. "Birth of President's Granddaughter Doesn't Warrant Newspaper Article." Letter. The Daily Gamecock, February 3, 2014, p. 4. 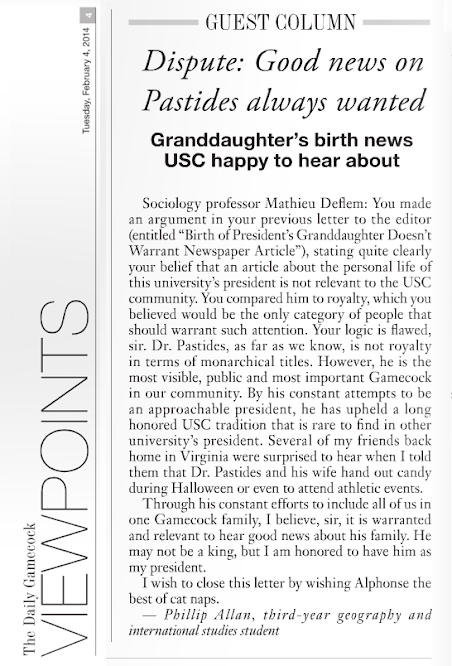 As a daily reader of The Daily Gamecock, I was more than a little surprised to have to read a cover story this past Friday that informs us of personal family details of the President of our University of South Carolina. Upon reading the article, I was even more stunned to learn that the President had contributed to the story by means of an email interview. Not only do I fail to see the relevance of this story, it poses a somewhat confusing situation. After all, while Dr. Pastides holds the position of University President not on the basis of an election, but upon appointment following a national search (that evidently turned inward), his position is not that of a King to whom such reporting would ordinarily be applied. Conversely, should the Gamecock be interested in the private lives of any and all members of our University, I encourage students, faculty, and staff to share their online posted pictures with the paper! 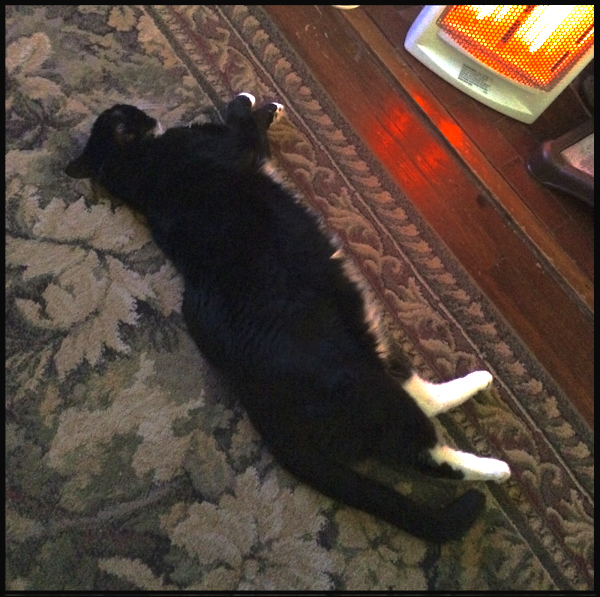 Setting the example, here is a picture of my cat Alphonse that I shared on instagram during last week’s snow days. I trust the Gamecock will write a story of this important event in my cat’s life. Either that, or we’ll have to go buy somebody a crown. Update: click for a response and related Twitter chatter. See related writings on other university business issues.